I reviewed this set a while ago, which can be found Here on Armorama. I have to say I would agree with that statement. 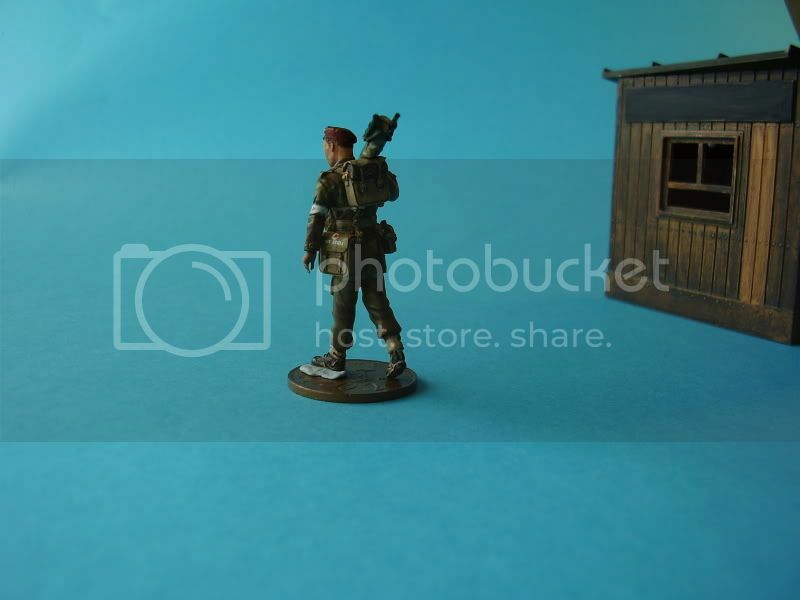 No other manufacturer, either of plastic injection or resin products, has such a wide range of British 1/35 scale figure subjects covering Tankers, Infantry and Paratroopers. 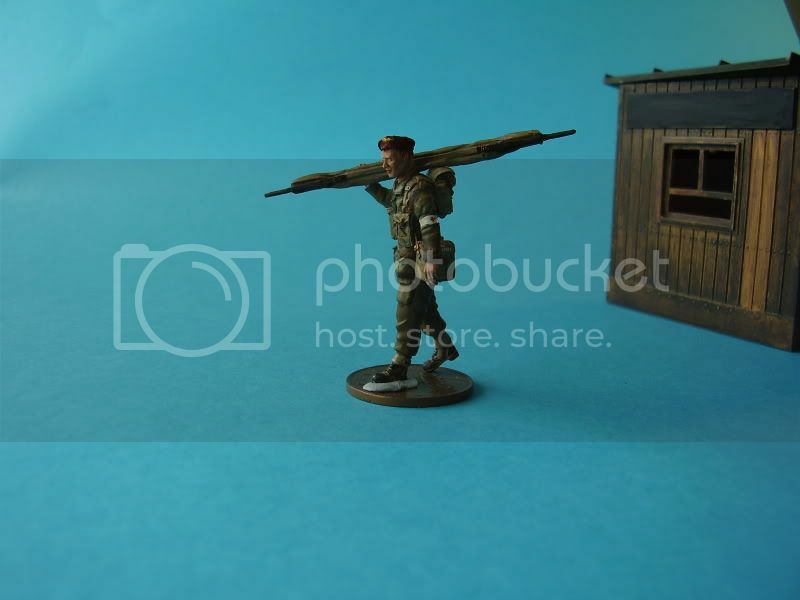 Whilst other manufacturers pay lip service to the British/Commonwealth 1/35 scale figure side of life, Resicast are still the market leaders in this genre. Many of the Resicast figures started life 10 or 12 years ago and will be familiar to many, yet few on line reviews exist of these excellent figures. I hope to balance that with a look at some of these older figures that still, in this advanced age of technology, have a level of quality and detail about them that few have been able to match. I am not a figure expert, nor expert on any specific military vehicle or genre, like many I model for pleasure and fun. So at the outset let me say I am bias to all things British and Commonwealth, but I will try and give you my honest opinion of what I think. One thing that has always ways struck me about Resicast figures are the variety of natural poses most of the figures have. In general they are a good match for other 1:35 scale figures, they tend to be of slimmer build and don’t really fit that well with the likes of Dragon whose infantry are slightly bigger in size. This is the first of a series of reviews on their British Airborne range that I hope you will find useful. This is standard for all Resicast figures; a zip plastic zip bag holding a paper insert showing a colour picture of the product and the maker’s name. The figure(s) are contained within another small plastic zip bag. The picture should help aid painting and rarely do you need, or get, any specific instructions. 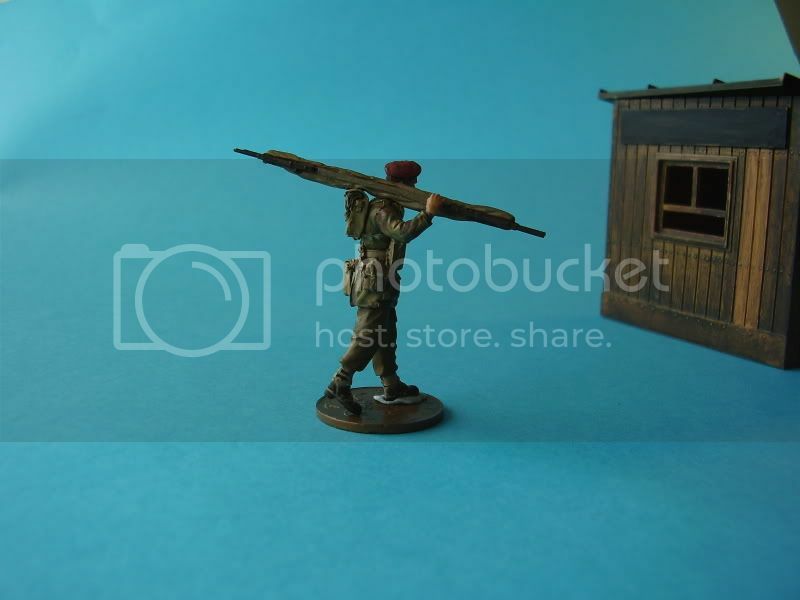 Cast in a light grey resin, this figure depicts a medic/paratrooper walking whilst carrying a stretcher over his right shoulder. The cast is excellent with good sharp and clear detail. The figure comes with a complete body, head, arms and separate stretcher. Minimal clean up should be required with only the removal of the small pour stubs on the individual items. Cast as a whole, the figure is shown in an upright walking position with left leg forward, and is dressed in a Para Smock, BD trousers, anklets and ammo boots. The smock is well depicted showing the correct number of pockets and crotch strap fixed up at the rear of the jacket. Studs are present in the right quantity and right place on the garment. Further detail is added in to the lower pockets shown well filled. The jacket hangs low enough to be a good image of the real thing. Under the smock can just be seen the collar of a shirt. On the trousers, the map pocket is in evidence whilst a good set of anklets and ammo boots finish off the clothing. The figure is depicted in full battle order. This includes a full set of 37 pattern webbing, left and right ammo pouches, small back pack with ground sheet, and as a medic, there is attached to the left hand side the small haversack that would have contained shell dressings, morphine syringes etc. The front and rear brasses are in evidence and the buckles are well depicted throughout the webbing. A little clean up may be necessary between the legs and the small pour stubs will need removed from the boots. The head sports a paratroopers beret complete with badge. The beret is pushed back on the head exposing the face of a young soldier. Detail on the face is very good. The right arm is bent at the elbow to clasp the stretcher, whilst the left arm is designed to hang down the body. Around the left arm is an armband that can be painted up to represent the medical arm bands worn by medical troops. Fastenings are in evidence at the cuffs. This comes in the form of a stretcher. British Airborne Paratroopers would have been issued with the folding type of stretcher and as far as I can tell this looks to be of that make. The stretcher is extended, but closed down for transportation. The stretcher will require careful handling when removing it from the pour stub and some flash needs to be cleaned up on the handles. A small indent is included on the underside to ensure the stretcher sits naturally on the shoulder. This is my first look at any of the Resicast Paratroopers, and this is an impressive start. The pose looks very natural; the detail on the uniform and equipment is excellent. The proportions of the body are well balanced. 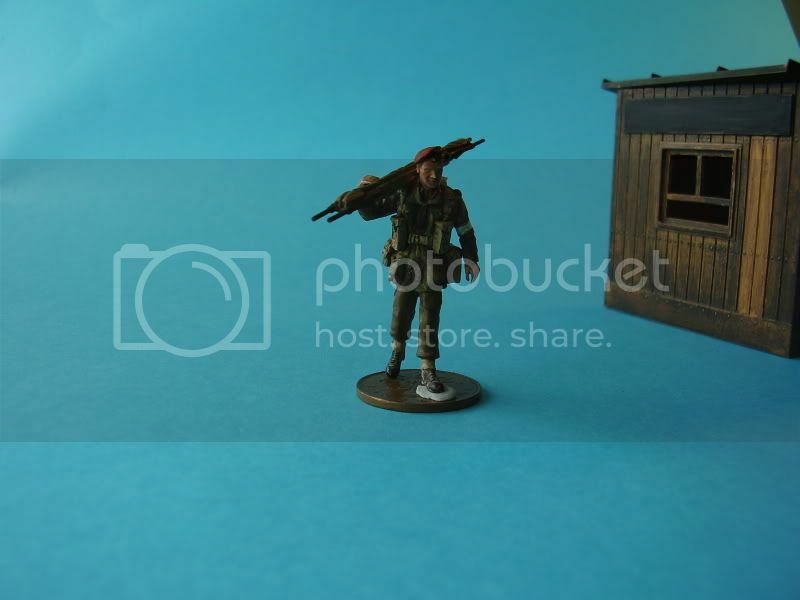 This should prove to be a very useful figure, and be of interest to both diorama builders and figure painters alike. From heal to tip of shoulder he comes in at about 40mm, with his head on and leaning forward on the left leg just under 50mm. This is just short of the 2” norm, but he does not look small to me and should be perfectly acceptable. The quality of the casting and detail provided should ensure that he paints up very well indeed. Most importantly to me is that he looks right; the pose, the stretcher over the shoulder, the head slightly bowed. The equipment detail is correct and accurate. All credit to the original sculptor and Resicast for an excellent figure. Highs: Excellent detail, good clean casting, an excellent figure all round. Good review Alan. I suppose you could substitute a piat or some other piece of equipment for the stretcher if you wanted.